A major feature of the mail sets I’ve assembled here is that they do not always include items such as helms, bracers, gloves, and shoulders. Working from the idea that these are sets for more casual wear, it seems to me that bulky, awkward items such as helms, shoulderpads and gloves would be the the first things to remove when one comes off-duty. I leave off helmets because especially for casual occasions I like to see my characters’ faces. Since bracers are usually entirely covered by gloves, I’ll use one or the other, but not both. 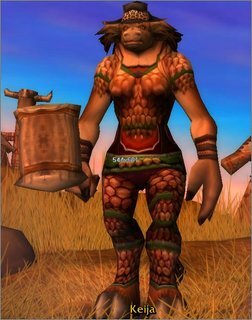 When my model is a Tauren, I generally only include boots if the leggings go all the way down to the ankle; in my opinion, leggings that end at the knee look fine on a Tauren without needing boots to complete the look, but leggings that go down to the ankle look somehow like long underwear if the outfit isn’t finished off with boots. If I have not included boots, boots which match other “set” items are generally a good choice. 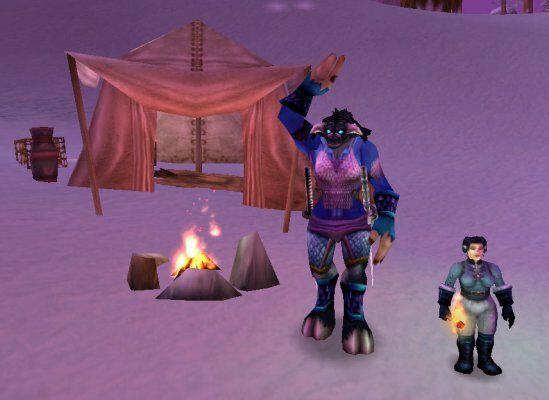 Though, as I noted above, I generally ignore helms for casual wear, I do have a favorite mail helm style — a silver crown like the one worn by the night elf Sentinel Spy in the last picture of my leather armor article. The easiest way to get such a helm is to find a mail or heavy armor merchant in a capital city and purchase the Augmented Chain Helm. 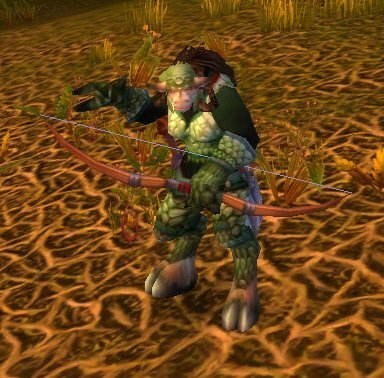 If you complete the Cenarion Thicket chain in Terrokar forest, you can choose the Cenarion Thicket Helm. A little looking in the auction house will probably also turn up a match of this style. Here’s my mage, Kaelinda, pretending to be a Farstrider. Something I particularly like about this gear is the way the chain covers all of the stomach and legs, even on a female character. I don’t have any basic silver mail to show, alas. Mithril mail, which Keija can’t make yet, is sort of a darker silver shade. 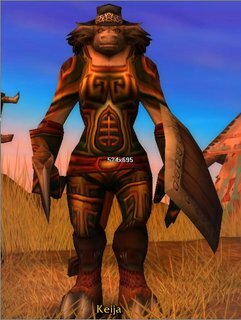 Padded Lamellar mail is a nice green-quality low level set, while high level Azeroth mobs drop grey-quality Laminated Scale armor. The Jazeraint mail set is another handsome option for silver mail, or you can buy the Scalemail and Polished Scale sets from vendors in capital cities. I really like the green trim on the Copper Chain Set, and the lovely green patina of the Runed Cooper Set. I’m not so fond of the Rough Bronze Set, but perhaps it might suit your taste better. The same set only with the Burnished Bracers instead of the gloves, and the Golden Filigreed Doublet instead of the Brown Linen Shirt. The choices of shirt and of gloves versus bracers will give any outfit a slightly different look. I’d use the first combination shown here for everyday casual type occasions and the second combination for an event where I’d want to be a little more dressed-up. For that sweaty, dust-covered, freshly off-duty look, use the Deckhand’s Shirt or Captain Sanders’ Shirt. But perhaps you want something a little more colorful…. The War Paint Set is a little interesting in that the graphics for the belt and the leggings are identical — so if you want to wear the full War Paint Set and not have naked legs, I’d suggest wearing only the belt, and finding yourself some Turtle Scale Leggings to wear instead of the actual War Paint Leggings. This trick will only work for RP, though, since the Turtle Scale Set requires level 40 while the War Paint Set is teens-level gear. I used the Councillor’s Sash in this outfit, but of course any green or golden belt — or green AND golden belt, such as the Deviate Scale Belt — of your choice would also go well with this set. 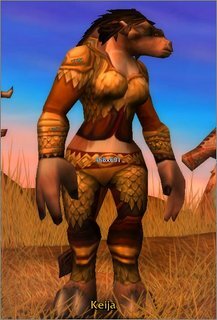 I built this outfit around the Violet Scale Armor chestpiece awarded from a Horde quest in the Barrens. 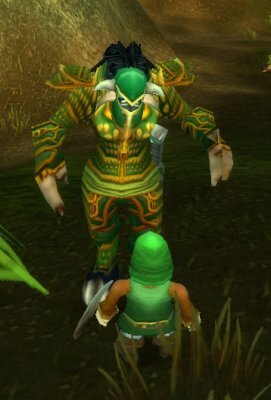 The same quest also rewards the dark green Harlequin Robes; since the world drop Conjurer’s Robes have the same appearance as the Harlequin Robes, if you can or will be able to wear mail, you should take the Violet Scale Armor. 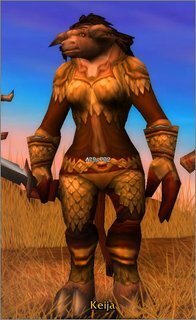 If you’re Alliance, look for the Outland-level Netherstalker Armor, which is very similar in appearance to the Violet Scale Armor. The belt is the High Councillor’s Sash, which I was lucky enough to have drop for me while I was doing some quests in the Plaguelands. The pants are the Blue Dragonscale Leggings, which are a blue-quality item crafted by leatherworkers. 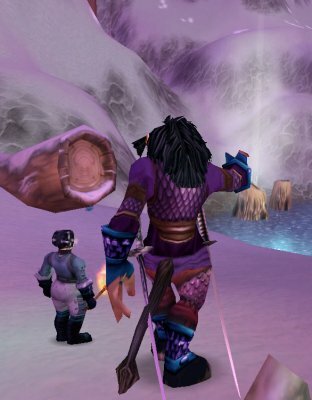 The only other pants I’m aware of which have the same appearance as the Blue Dragonscale Leggings are both quest rewards in Outland, the Brood Mother Leggings and Area 52 Defender’s Pants. And the Area 52 Defender’s Pants are from the same quest which rewards the X-52 Pilot’s Leggings…. decisions, decisions! This version of the outfit uses the Darkmoon Chain Shirt and the Netherstalker Legguards. From the front, the chestpiece looks more like leather than mail. 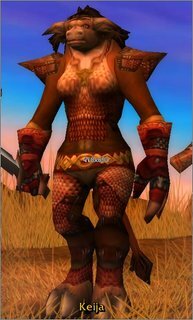 I forget whether I found the bright red, gold, and black Battleforge Armor by looting it while questing or while browsing the auction house. Either way, it was too handsome to pass up. 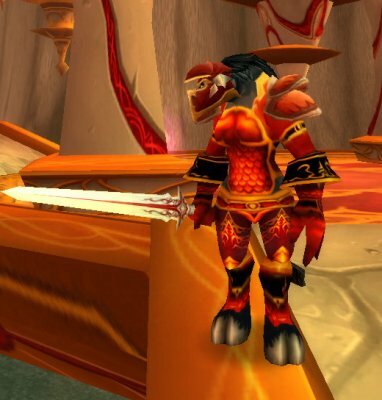 The Battleforge Set is mid-twenties level; the identical Blood Knight Set drops in Outland. Here, I’ve combined the chestpiece, belt, gloves, and boots of the Battleforge Set with Herod’s Raging Berserker Helm from Scarlet Monastery, Praetorian Pauldrons, and Hyperion Legplates (plate). 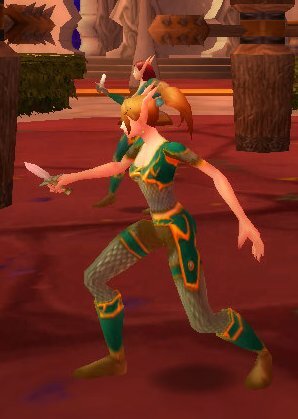 I chose not to use the actual Battleforge Legguards because a) I couldn’t find them on the AH and b) they look like mail short-shorts! This outfit would also look very nice with the leather Sun-Cured Pants, or any other bright red pants of your choice, or a pair of gold-toned chain pants such as the Burnished Leggings shown earlier. I’m using the Scarlet Filigreed Doublet, but any other red shirt would also work. The weapon is the Haunting Blade, a Scarlet Monastery drop. The vendor-purchased Augmented Chain Set (silver-toned) and the Brigandine Set (bronze-toned) look more like plate than mail to me, as do the blacksmith-crafted Shining Silver and Steel breastplates. The Heavy Mithril Breastplate is the first smithied chestpiece that is plate instead of mail and is a dark, pewter gray color. 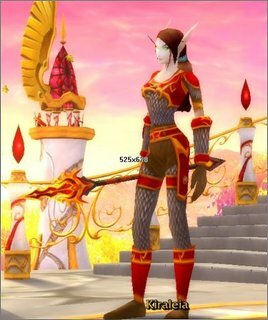 The Thorium Armor Set is in shades of red and plum, while the Fel Iron Set is light yellow-green. The whole Hyperion Set is a really rather gorgeous red and gold ensemble. 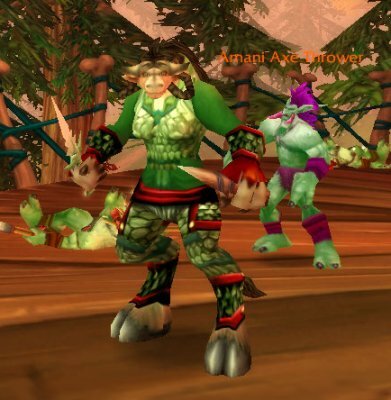 There’s an attractive leaf-green Emerald Set which drops in high level Azeroth zones and dungeons. 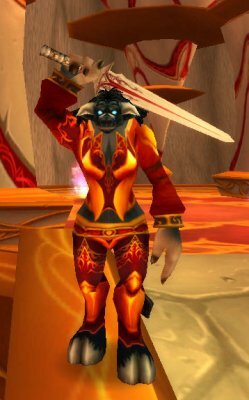 Female warriors, paladins, and death knights who want to show that they’re still girly-girls inside should look for the rose-pink Bloodscale Set, which drops in low-level Outland zones. 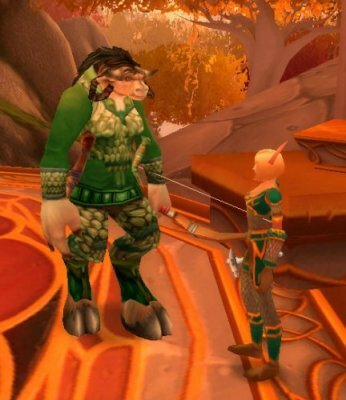 I really love the Golden Cenarion Greaves Katelyra got as a quest reward in Hellfire Peninsula. And, of course, if I do a search at the auction house, I find a number of nice looking plate chestpieces. Perhaps at some later date, when I have played some more with my plate-wearing characters, I will come along and add another section of plate-themed sets. But don’t expect it anytime soon.